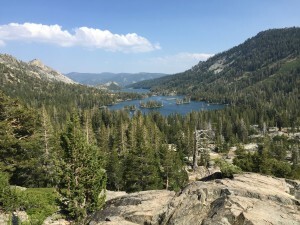 The Desolation Wilderness with no traffic is about 3.5 hours from the Peninsula in the Bay Area. We left on Saturday morning, had lunch in the In N Out Burger (good way to start and end the trip) in Folsom, and arrived early afternoon. After last minute gear checks, we boarded the boat launch across lower and upper Echo Lake. Cottages dot the shore and along the shallow canal connecting the two lakes. 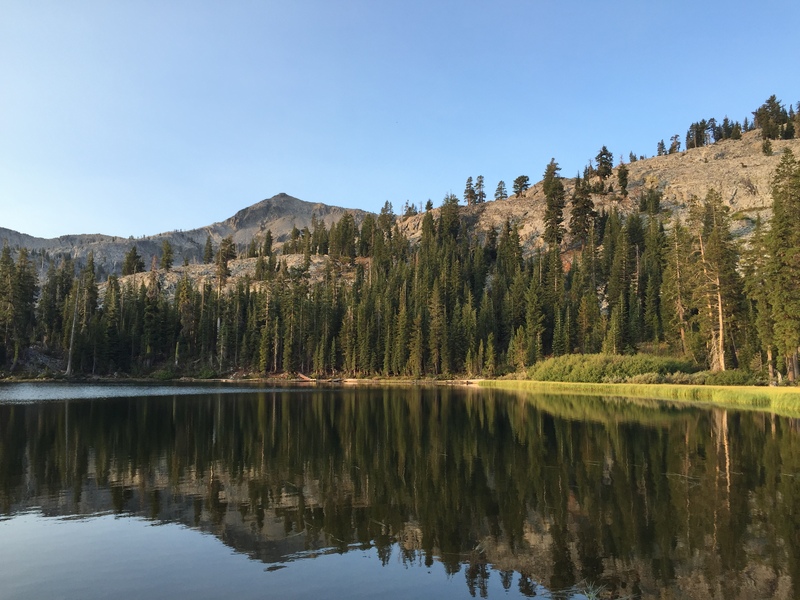 The USFS leases the land beneath the cottages, and individuals own the houses.The cottages are accessible by boat or some by the PCT. Stepping off the boat feels like stepping into a wilder world – like I’m leaving my day to day and entering something magical from Middle Earth. The four year olds did an excellent job staying motivated as we climbed uphill and in and out of shade. We played guess the animal game (thanks Shan) and took a number of breaks with some special snacks. Positive peer pressure also helped a lot. As the trail ascended to Haypass Meadows, we took our Tamarack Lake trail to the left. We watched the rock cairns and picked our way down to the lake. After a little scouting, we found an idyllic campsite just off the lake. 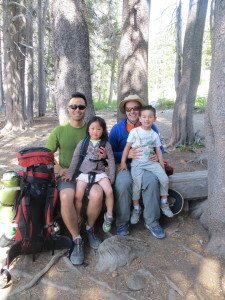 Camp highlights included camp chores like climbing many of the boulders, throwing rocks and sticks, watching the big dipper, the milky way and stars at night, cooking and setting up camp, and watching the resident ducks and bats. 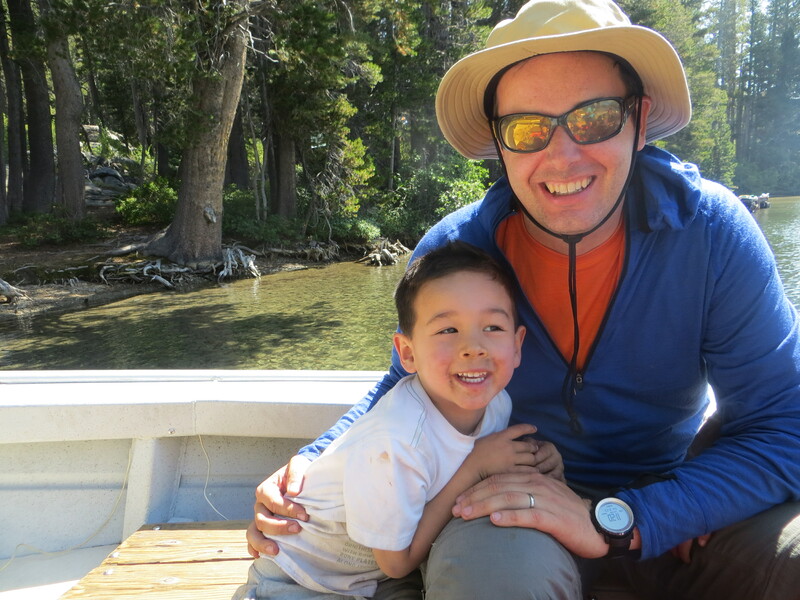 We also explored the rocks, roots, and fauna around the lake – both at sunset and sunrise. 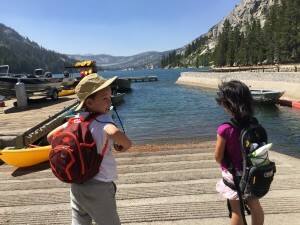 Hopefully, next year, I can plan a kid centric backpacking trip with more than four permit spots – which just takes a little planning. The three mile roundtrip was a successful backpacking trip. 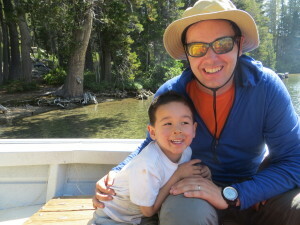 It was my little guys second backpacking trip after Angel Island, and his friend’s first. On the way down, the little guys climbed more boulders, chased some lizards, and took petted many ascending hiking dogs. The little guys and their dads enjoyed many compliments about the young hikers. 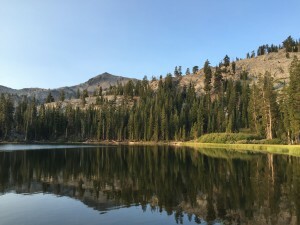 Tamarack Lake, the PCT, and the TRT are excellent locations to share the joy of backpacking.